"Hey bus driver, can I ask a question? Is it ok to bring tools on the bus?" He was a young man, in his 20s, as we headed north on the 50 near the Pompano city limits. It was the middle of the day, so perhaps he wasn't familiar with the countless day laborers who bring all manner of tools aboard in the morning and late afternoon. Now the word 'tools' covers a multitude of objects from the benign to the deadly, so I didn't want to give a blanket answer. "What kind of tools? As long as there are no exposed blades or anything that can hurt another passenger if they bump into it, it should be ok," was my tentative answer. "Oh, it's a tamper and some asphalt. I got a job to patch up a parking lot." We'd just crossed into Deerfield at the north end, he asked when I would be coming back around, then jumped off and went running down a side street. He must have been glad to find a driver who didn't give him a hard time, because sure enough after our north layover we headed back south and there he was on the opposite side where I'd dropped him off. He hadn't had much time, and he wasn't travelling light. Upright by his side was the tool of his trade, a heavy duty asphalt tamper and a partially filled bag of cold asphalt. Nothing was leaking, the bus was mostly empty this early in our trip, and he stood up front with his gear so we kept it moving. "You must keep busy, there's no shortage of potholes out there," I commented. "Yeah, there's plenty of work, but it's hard getting around by bus. I always ask just in case." I had to admire his resourcefulness in seeing this job got done. A lot of things come down to timing, and the timing worked out for this street smoother. Most of Dixie Highway in Broward County has managed to be immune to gentrification. With the exceptions of the downtowns in Oakland Park and Pompano, virtually the entire length north of Broward Blvd has remained frozen architecturally. The remaining buildings, most of which would probably clinch historic status if they weren't so busy being used for practical everyday purposes, are for the most part occupied and well-maintained. The spaces are repurposed, restaurant cuisines change, thrift stores come and go - all presided over by the FEC. It's not a derelict district, just low-rent and time worn. It is this stretch more than any other that stirs up my own nostalgic sentiment of a simpler time. The place just feels right. Until recently, one of these untouched spots was by the tracks just south of Hillsboro Blvd. Massive old wood-sided warehouses presumably once stocked full of local produce to be shipped north stood as silent sentinels from Deerfield's agricultural past. Their voice was in their faded colorful paint schemes, delicate blues belying their rugged design. The whole complex was an ancient holdover of a less-engineered time, rough-hewn and uneven. It is now too late to take those pictures I always intended to take, to document and archive that place for the future. Still, it exists somewhere, where the light slants a certain angle and that scent in the air lets you know exactly where you are. The shock and wistfulness would be overtaken as soon as we serviced our next stop: Life. "I just want to pardon myself for last time," came his classy confession. A few weeks earlier this gentleman had been in a brief altercation on the bus. A regular always with a yoga mat when I pick him up, he is clearly a refined and self-aware individual who had let a small-minded bully get the best of him. "Don't sweat it, it happens," I sympathized. At Commercial, we pick up two guys with a heavy load. Three 18-bottle cases of Heineken are apparently not as easy to tote as one might think. "Alright! When's the party?" I blurted out as a greeting. A quick worried glance that I was serious gave me the impression they'd invested heavily in this stockpile. One guy swiped his pass, the other just gave it to me straight: "I blew all my money on the beer." He may have offered me a bottle in lieu of fare, which I kindly declined for the obvious reason. What would a trip down Old Dixie be without a visit from one of its own: Ace. At our first Central Terminal visit, we get the requisite "Just got outta jail" request for a freebie ride, complete with papers to prove it. But hey, ya gotta get home after a night at the New River Hilton. Yeah, Mr. Mercedes is riding with us today. A snippet in a lady's voice in the back: "God is my Holy... Bite me!" Energetically, a middle-aged man in good condition came aboard, braced his legs to steady himself for the bus to move while he paid his fare. The bus remained still, but I had to compliment him on his readiness to keep things moving as he fed his bills into the box. "I'm good, you can roll" he informed me, like this was how he always got on the bus. "I'm used to body surfing," he explained, and he sure was in a surfing position. "Bus surfing!" I offered up as a more accurate term. History and remembrance have their place, and museums will always have a layer of dust. Over here on the 50, we're stocked up on Life. Every pick I try to select Route 10 for at least one day of the week. On paper it's an unremarkable run straight up US 1 from Central Terminal in downtown Lauderdale to Mizner Park in downtown Boca. Part of the allure is the constantly changing scenery. The current construction boom is reshaping that street from one end to the other, a clear contrast to the static visual environment over on Dixie Highway. It is bittersweet to see landmarks you grew up with unceremoniously demolished for newer, denser construction. Of course, it's always been this way, I just can't recall it being so focused on a single corridor. 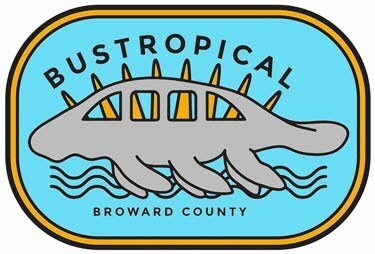 Broward is nearing 2 million residents, and people gotta live somewhere - so why not Federal Highway? The other part of the allure, the main part, is essentially the same thing that draws me to other routes: the riders. Neighbors, visitors, young, old, excited, depressed, et al - this route has more than its fair share. So last pick I had one day a week on the 10, a split shift that started with a single southbound trip in the morning. One morning on that first trip we pulled into the Sample stop and an older woman boarded. Certainly not elderly, but let us say seasoned by the sun and the effects of a life fully lived. She had one of those smiles that reveals an inner youth, an infectious grin that squinted the eyes and smoothed the wrinkles. With a raspy voice evocative of a female Tom Waits, I'd love to hear her belt the blues on stage, but this day I would settle for being chatted up from Pompano to Central Terminal. No, she wasn't flirting with me, though her pointed questions gave that impression. She was trying to set me up with her daughters, both newly single, one with a 20 year old son. Though I'm not against the concept of a ready-made family, this arrangement wasn't for me. Even so, she was so sweet about it I couldn't help but thank her for the thought, and wished her luck in her matchmaking. "You know, I was born with a caul," she offered. I had to roll through my mental dictionary to recall what that was, but had a vague idea it was some sort of membrane that remained after birth. "You know what a caul is? It's very rare, and it's good luck." After a break for lunch, I set out on the second shift of the day. As we approached Atlantic Blvd, the police presence grew. The air was filled with siren wails, and all the side streets were blocked by a BSO cruiser. Unmarked vehicles with red and blue flashers zipped by us. We crossed Atlantic and serviced the pull-in bus stop. A middle-aged woman boarded, unfazed though she had been in the epicenter of the frenzy. She stood up front and I pulled out, wanting to limit our exposure to whatever was going down. As soon as we got going, a teenage boy came running around the corner of a building in our direction. A couple BSO deputies followed close behind in hot pursuit, guns drawn. The kid gave up after the bus stop and dropped to the ground. "I would have tripped him," the woman claimed as he surrendered right where she'd been waiting. On a northbound trip, the ongoing right lane closure on Sunrise during rush hour meant a 10-minute time waste to cover 1/4 mile. I took this time to wonder why buses don't have Not In Service signs for malfunctioning pull cords or dirty seats. Our next visit to Central Terminal I boarded a familiar face in a wheelchair. He was a coworker at a previous job when I was in the printing industry. I'd picked him up a few times before on other routes, but was surprised to see him taking the 10. He may be disabled, but he hasn't let it keep him from moving forward. A perpetual ladies man, he always seems to have a different girlfriend when I see him. On our final trip, I could see two figures waiting on a bus bench. A young man and woman, I wasn't sure if they were wanting the bus or just hanging out, so I slowed down in case I'd have to stop. I gave a couple love taps on the horn, and her arm went out to hail the bus. They were extremely slow making their way from the bench to the door, and the young man was assisting the woman. Her legs were in an awkward position for walking, and her face was contorted in a grimace. They were both young and looked healthy. "Are you ok?" I asked, trying to see if she needed help. She could barely walk, so I lowered the bus as she labored to board, all the while her friend helping to support her. "I have lupus," she explained with tears in her eyes. Her pain was quite visible now. The friend got her seated, swiped her pass, and kissed her goodbye. She was now on her own and distraught. "I'm afraid..." she said quietly to no one, an inner thought shared with the world. We are constantly looking for order. It is seen in street grids, zoning regulations, and graveyards. Organization, tidiness, linear solutions in a circular world. Time itself is an arbitrary measurement we've established, helpful in many ways and discouraging in others. Does everything happen in its time, in due course, naturally? When I enter an empty bus in the morning, before the pre-trip inspection, I greet the space with a quiet "Good morning, Broward County." Four simple words meaningful perhaps only to me: it is a welcome to what ever neighbors or visitors may board that day, along with a tacit promise to serve them well. Through the revolving doors of the bus enter and exit innumerable histories. Countless disparate paths wend their way around the planet to enter those doors, a moving space alive today but one day relegated to the scrap yard. I tend to see similarities between our paths and those of various celestial bodies; some are fixed, others are on an unknown trajectory. Mysteriously, they are all connected and occasionally cross paths as they make their cycles. An afternoon on the 50 is bound to be an adventure. Or, it used to be. Service improvements have altered the character somewhat and only time will let the route show its new face. Still, there is plenty to ponder over what has gone before. At SW 10 St in Deerfield, an ancient woman in a red minivan is vaping like a steampipe. A young lady on the sidewalk sports bright red hair a la the Wendy's girl. Our first layover on the north end, a father with two young sons boards. I always greet little guys with a cheery "Hey, big guy" or "Alright, big step!" so a mundane bus ride becomes a minor victory. They like it. On our way south, we pick up our irregular regular, Ace. He's in a hurry, no time for small talk. At Five Points in Wilton Manors, a regular in a chef's jacket boards. About middle age, at least once before he's gotten on with an expired day pass and the same phrase. He swipes the pass as it gives a denying buzz, and with that distinctive Haitian accent which is both heavy and perfectly pronounced says "Driver, I'm having a bad day, please help me driver." All the while he's moving into the bus, not waiting around for my response. We were stuck at the light and he sat up front, so I slowly turned my head in his direction. This time I was able to give a response. "Do you ever have a good day? Was yesterday a good day?" I asked in a sincerely inquiring tone. For the sake of balance in the world, this hard-working man must have some bright moments. "Maybe tomorrow," he responded. He explained he's a dishwasher at a couple restaurants. We talked about which ones were the best to work for around town, mostly Las Olas and the beach. Briefly energized by the conversation, the day's weariness soon returned and I could visibly see his weight bearing down. "Times are tough. Bills are big and money is little." The next northbound right after the NETC we kept pace for a moment with an FEC train linked with endless quarry cars piled high. I remember a stat from years ago that half the state's roads are built with Dade County limestone. This material is the heart of the earth, at least our part of it. Unique to the southern part of the peninsula, it was born of the ocean as it is comprised of the exoskeletons of minuscule sea creatures. When used to make roads, it introduces a treasure trove of fossils for city dwellers. "You always forget me, man!" the vaguely familiar rider jokingly chided. A young man, he didn't pull the cord and expected me to remember his stop. A little different accent here. First I'm thinking Jamaican, but when he says "Thank you" to indicate he wants to stop, I change my mind to Haitian. That's how many of the older ladies with limited English request a stop. We're on our second southbound, sitting at the Sample red light. A man comes out of nowhere and knocks on the door. It's a safe spot so I pop the doors. He's out of breath and I ask where he came from, since I didn't see him out there before. "I left it at the counter" he gasps with a smile. "I was in the store, looked out the window, saw the bus, and ran." He wouldn't have a long wait for the next bus if he'd missed ours, but I suppose we saved him some money that day. Uh oh, here's Smiley. A personal nickname for the young man in Pompano ceaselessly wandering the streets for another high. I have major compassion for this fellow because he's clearly caused irreversible damage to his cognitive function. Yet, he has a perpetual smile, never causes trouble, and generally attempts to pay his fare. He no longer has the ability to sweet talk or schmooze a free ride, or utter a coherent sentence. Parents point him out to their kids as a warning against drugs. Our final northbound just out of downtown, we pick up a frequent regular. Looking comfortable in scrubs, he has a convenient stop at the animal hospital where he works. "There he is, saving the world one dog at a time!" I announce as he boards. "Cats, too," is his quiet comeback. At the end of the day we all go our ways, each to our own orbit. Good day, bad day; it can always be better, but it can also be worse. Considering the alternative, not that bad. At a certain hour of the morning, when the sun is still rising, the light hits the street at just the right angle. It doesn't matter how bleached out the asphalt is (or how black it is), when the rays gleam at that magical moment the road before us becomes a ribbon of gold. For that brief moment, we are gliding on a gilded highway. There are no oil stains, no skid marks, no cemented chewing gum visible during that passing illusion. The eyes widen, the glare draws the gaze, and the harsh environment is softened as we speed toward the source. I used to enjoy the same effect on the 36, now the 72 has given me many of those moments, thanks to the broad expanse of Oakland Park Blvd. Saturday mornings we don't have to contend with the gridlock and accidents which are the order of the day during the week. By noon it reverts to its normal busy self, but for those precious hours we have tranquility. One morning after the above spectacle had taken place, a man boarded and presented his pass directly to me rather than proceed to swipe it through the fare box. Inspecting the pass, it was clear to see the magnetic strip had worn down to an unreadable remnant from frequent use. There was writing in pen on the back, in the recognizable hand of a Central Terminal supervisor, indicating that a few days remained on the monthly pass. Presumably middle-aged, he boarded somewhat sheepishly, not quite sure enough to hold his gaze. Recognizing the validity of the pass, and familiar with their temporal durability, I told him it was ok and waved him on. I thought nothing more of it and was well on my way when he wandered back up to the driver's area. "You're the first driver, of all the drivers, who articulated your recognition of the problem with the pass, instead of looking at me like I'm holding a foreign object," he gratefully explained, slightly choking up. "It's alright, those things wear out, it happens. It's not the end of the world." "I'm out of work right now and I use this pass 7 to 8 times a day to follow up on job leads and go to interviews," he continued. As we spoke, it became apparent that this was a once-proud man, educated, and unfamiliar with his present reality of having nothing, including personal dignity. Yet this became a shining moment, when a flawed man with nothing to give revealed himself in a way we rarely do when we allow ourselves to be equal hearts. One night I was working RDO which meant a late night piece on the 72. It was a revelation to see another side to this most chaotic of routes. Daytime runs are a blur of packed artics contending with endless miles of traffic congestion. This night run was like a Sunday stroll. It was quiet as could be, everyone either wrapping up their day or heading to a night shift somewhere. A good percentage of our sizable homeless population consists of military veterans. Many proudly wear embroidered hats from the conflicts they participated in. Vietnam, WW II, Iraq, Afghanistan, even the Cold War are frequently represented. Admittedly, there is a smaller percentage among that group who never set foot in a war zone, but wear the 'souvenirs' for a level of respect they otherwise wouldn't receive. This was confirmed by an older gentleman wearing just such a hat, though I believe he's the real deal. Sgt Rob Davis boarded that night on one of those quiet trips, eager to talk. A conversation that initially dwelt on a tedious subject like transit fares soon transitioned into casinos, previous occupations, homelessness, veterans, and respect. His current focus is working with widows and the children of fallen soldiers. He says it's therapy, this supporting of others in their time of grief, and that it helps him with his own issues. He lamented a growing disregard for the sacrifices of America's veterans. It was certainly lament and not outrage that was being expressed that night. "If you as a bus driver just show the smallest bit of respect to a vet, ask how they're doin', it means the world to us." With Fleet Week kicking off this weekend, I can't help but express some gratitude for those who lay it all on the line. A number of my posts are depictions of a certain route, using incidents from that route that occur on different days. For the most part, I try to avoid this because it doesn't always paint a true picture of a day in the life of a bus driver. Artistic license gives me a pass to mix and match, but be assured every word of it is true. Sure, there's some subjective perspective coloring the picture, though I see no reason to exaggerate or fabricate because the truth can stand on its own. And truly, one day's stories are enough. This one Saturday on the 72 was shaping up nicely. My first eastbound trip was uneventful from Sawgrass to the Galt, but it was early yet. The first westbound trip things started brewing. First, at US 1 the group of active political sign-wavers is in full force. Their signs are always timely based on current events, and quite elaborate. Some signs are on extra-long poles leaning over the street; I'm hesitant to pass knowing how high the bus is, so I slow down till the obstacle is pulled back. At the next stop after the light a long-forgotten bearded face from late nights on the 10 boarded. It was Josh, an apparently homeless man of unwavering manners and gentle speech. I try to remember names as best I can, and his distinctive appearance makes it easier than most. The look never seems to change with the years: hunched with both arms perpetually hanging with countless loaded multi-layered plastic grocery bags of indeterminate contents, scraggly shoulder length hair, WA cap, and Ray-Ban style sunglasses even at night - he's instantly recognizable. Plus it helps to have a brother who shares his name, though he doesn't need to know that. The shock of his name being pleasantly called out by a vaguely familiar bus driver was enough for him to process that morning. He always has his pass and is ready to pull it out, but the collection of bags are essentially an extension of his person and disengaging them proved early on to be a time-consuming effort. So those times when he recognizes me he'll inform me he has his pass, and I generally spare us all the inconvenience, potential bag spillage, and lengthy wait of going through the formality of the swipe. Today he has a new accessory: a triangular white paper guard covering his nose, presumably handmade. Not wanting to intrude, I don't mention it and instead we discuss the latest releases at the movie theater. A few blocks later he exits and melds back into the streets. The next eastbound was much like the first. I'm a habitual reader and my eye naturally gravitates to words wherever they may be. I especially get a kick out of routinely changing signs, particular businesses and churches like to put pithy proverbs out for passersby. As we approach St Helen's Catholic just before Martin Luther King, I check out their current posting. Formerly the Serenity Prayer, there is now a single verse: "This man welcomes sinners and eats with them." A brief reflection upon the accepting sentiment and we keep rolling. Our last westbound, we just have to get to 441 where the relief driver awaits to take over for the afternoon. The distance is probably 5-6 miles, less than half a trip. Don't remember where I picked them up, but it was on the eastside. A man and woman, tipsy drunk but friendly. They told me they had their passes, then sat near the front to look for them. Meanwhile, she's talking up a storm. "Where are we going? How messed up are we?" she kept asking in a wondering, happy tone. At the next light, the man came back up and swiped both passes. She called out to me. "Hey driver, is there a hotel around here?" I asked if she was looking for a certain hotel. "No, just a hotel, any hotel." We had passed I-95 and this stretch of Oakland Park doesn't have any so I let her know there were plenty in the opposite direction. "Where are we going? How messed up are we?" While they pondered their next move, traffic was backing up thanks to utility crews closing the right lane at the height of lunch hour. We had just passed the Home Depot stop and were stuck at the light. Out of the corner of my eye there was some movement, so I glanced over to see two figures running our way from the shade of an office building across the parking lot. Another man and woman, she doing her best to keep up. He was really moving, with beer bottle in hand like a Hash House Harrier. He put one foot in the door and I pointed at the nearly full Heineken. For a brief second it looked like he was having second thoughts about not finishing his drink, but ultimately decided to go for a ride and tossed the green bottle in the grass. "Hey man, we don't have any money, can we get a ride?" he implored. He could almost pass for Luther Campbell's younger brother, in smart glasses. Nevermind the current price of an imported beer, he was totally skunked and now wasn't the time to have a rational exchange over spending habits. "This one's on me, grab a seat." The light turned green and I was ready to roll. "Thanks man, I know you don't have to do that. I just wanted to ask you out of respect." We shook hands and the two disappeared into the depths of the bus.